2019 has started with a bang when it comes to my investments. And that’s a good thing! After the later part of 2018 saw a medium crash in the value of many of my index investments, the first 2 months of 2019 have made a great recovery. An updated property assessment also saw a large gain in my assets. 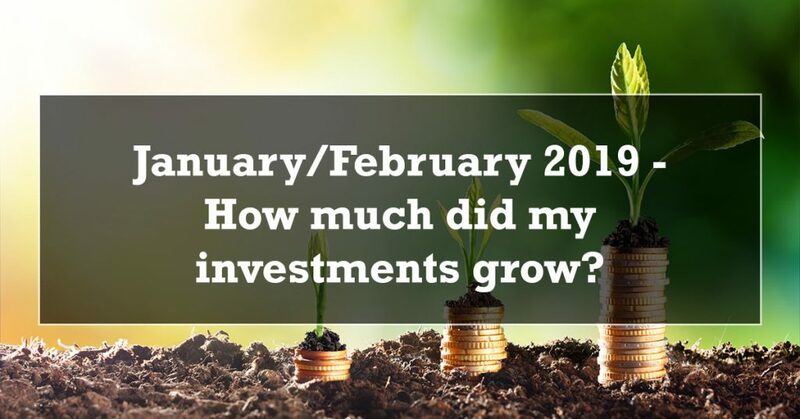 Let’s take a deeper in look in my January and February 2019 investment portfolio update. Generally positives across the board in the my investment assets for January and February. You’ll notice a huge spike in my home equity, which I’ll discuss further below. I was able to make quite a few cash contributions to my portfolio as well, which helps raise my overall net worth. January and February saw gains across the board in my TD e-Series index funds, particularly in the Canadian and American equity funds. I was also able to make some bigger contributions over the 2 months as well, which I split up between funds to help re-balance into my 23%/23%/23%/31% target allocations. The gains for my TFSA portfolio of TD e-Series funds pretty consistently rose over the 2 months. While November/December 2018 saw a 1.4% drop in my TFSA index funds, January/February saw a 5.4% increase! As I’ve written before, I keep mostly the same assets in my RRSP TD e-Series portfolio as I do my TFSA, except I go with a more aggressive approach with no Canadian bond index fund. I focus on growing my TFSA more than I do my RRSP, but with tax season coming up, I decided to give a healthy bump to my RRSP in February with a large cash contribution. A more aggressive approach typically means higher gains when things are good, and higher losses when things are bad. November/December 2018 saw a 3.1% drop in my RRSP TD e-Series portfolio, but January and February saw a 5.6% gain! New to my investment portfolio update is an overview of my additional index investments. While TD e-Series funds are still my main investment method, over the past few months I’ve branched out into some other index investment methods like Tangerine Investment Funds and Wealthsimple Robo Advisor funds to try them out. They only have small amounts, but let’s take a look at how they’ve done. My Wealthsimple Growth Portfolio saw an approximate 4.4% growth. The Wealthsimple growth is skewed by the contributions I made ($50 a month) and the growth is actually higher than 4.4% over the 2 months. I’m continuing to make 2.5% interest on a promotional offer from Tangerine, which is over at the end of March 2019. If Tangerine doesn’t continue the offer after that, I’ll move my savings over to my EQBank 2.30% savings account. $40 interest earned over 2 months for savings that are just sitting there isn’t too shabby though. January saw the release of updated property assessments for my municipality. Living in a city with ever rising property values (for the moment anyways) saw a big increase in the value of my condo. I use the property assessment as the main value when calculating my equity. This lead to a huge equity increase as the beginning of the year for me. While it’s impossible to know how much my property would sell for in the real world, using the property assessment gives me a good estimate to know how much equity I currently have. Surprisingly, my small cryptocurrency investment was the most stable of all of my investments. I’m still down quite a bit since I originally got in. As I reiterate every update, my crypto portfolio is a very small percentage of my investment assets, and it’s my “for fun” investing. If it all completely tanks, it won’t affect my overall net worth by that much. January/February saw a 1.6% drop in my cryptocurrency assets. As you can see in this investment portfolio update, January and February paid off for my index investments. Not reacting to major market fluctuations like we saw in November/December has allowed me to regain the losses, and profit off of purchases made in those 2 months. Patience and long-term gains are the key, and January/February showed why.